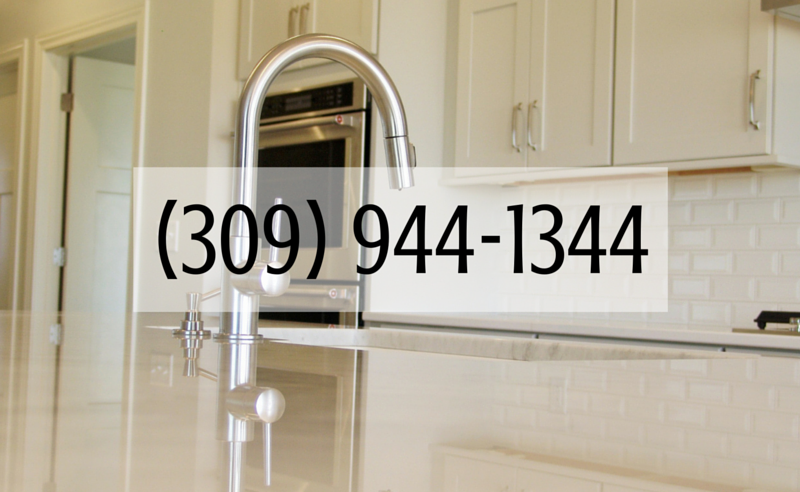 Take a look at any magazine cover or browse kitchen ideas online and you will discover very quickly that A white painted kitchen is still the current look. 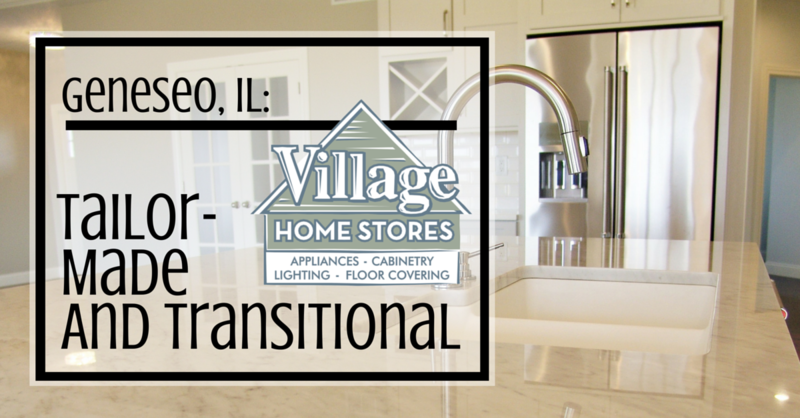 Our design sales staff from Village home stores teamed up to create a magazine-ready finished look at this Hazelwood Homes Inc. home built in Geneseo, IL. 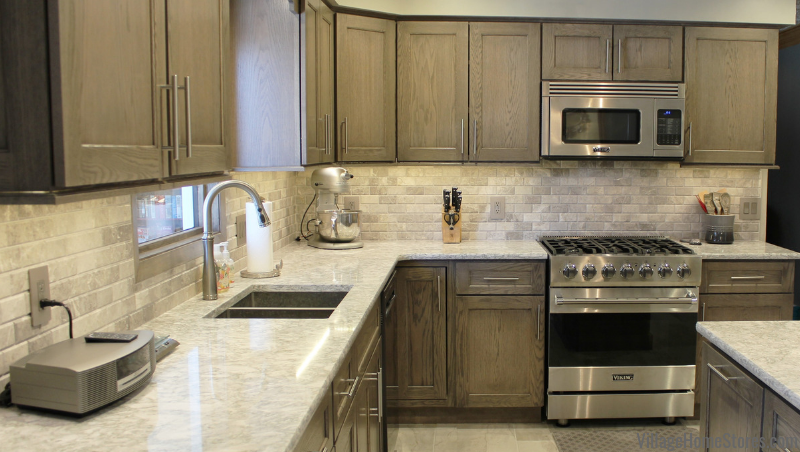 Painted “Oyster” Maple cabinetry in the “Savannah” door from our Koch Classic line is paired with a KitchenAid Stainless Steel appliance package. 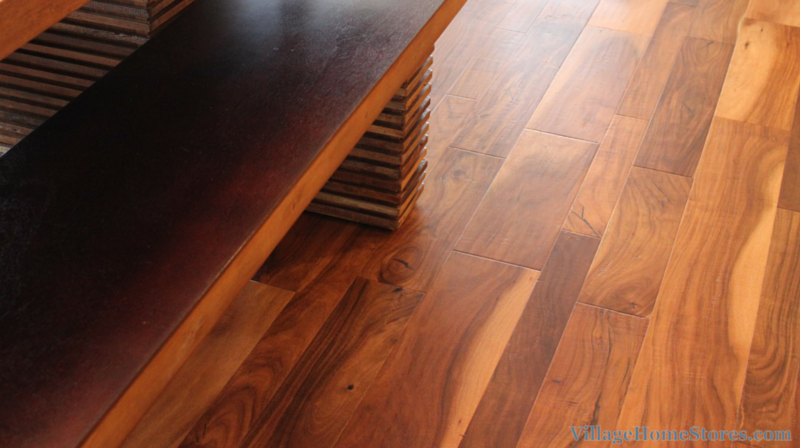 Warm and full of a variety of wood tones, this Hickory hardwood flooring from Sommerset’s “Character Collection” anchors the look in the “Saddle” finish. 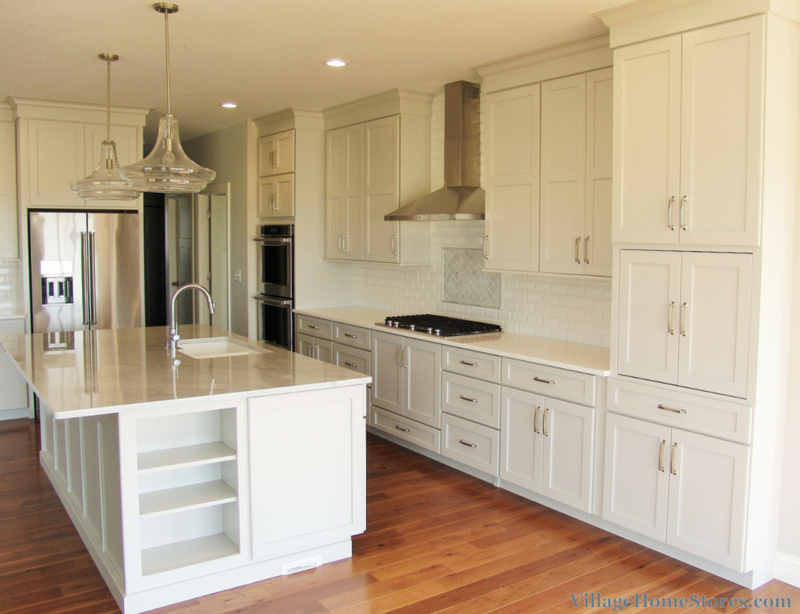 Painted cabinetry and selections like these Kichler pendant light fixtures above the island help keep the space light and airy. 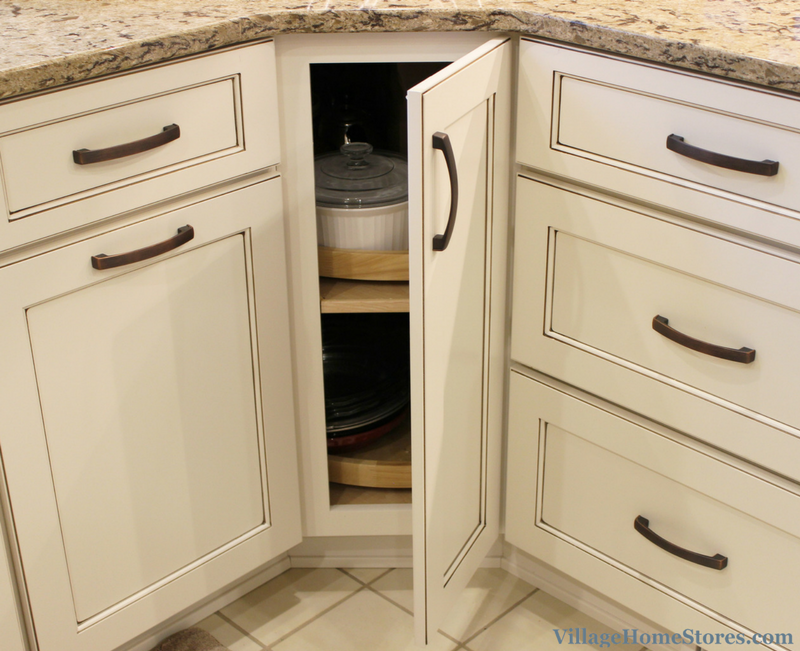 This is a surprising success considering how many large cabinets that have been included in the design. 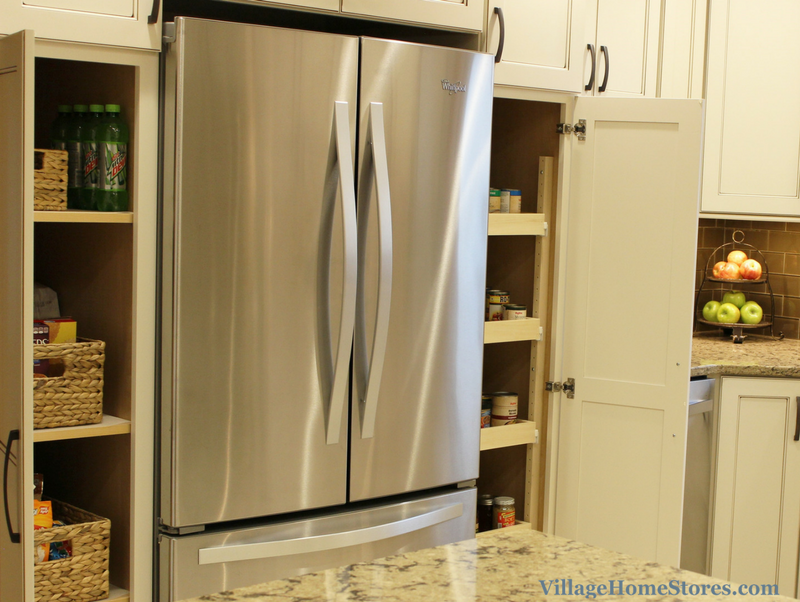 In new kitchens we have began to expect to see a refrigerator surrounded with panels and cabinetry that stretches to the ceiling. 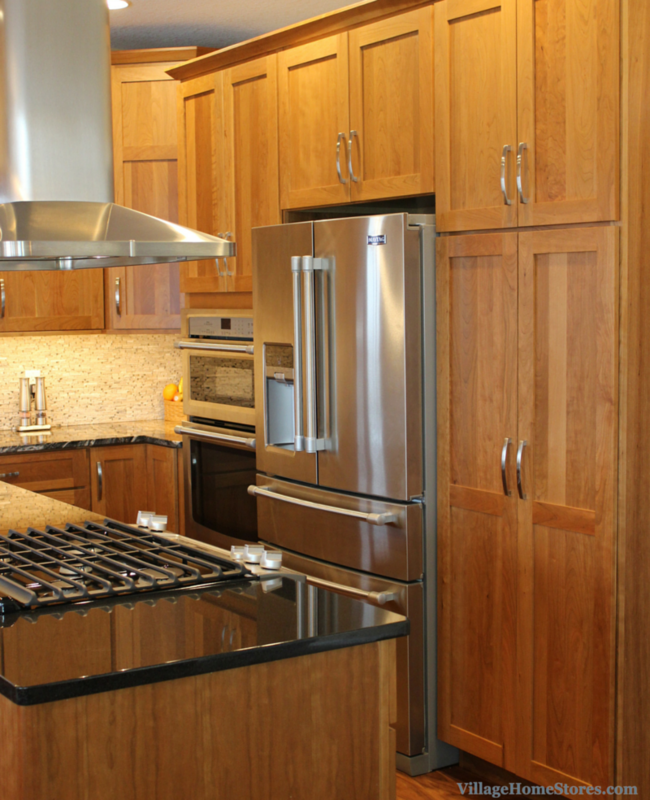 Tall pantry cabinets and wall ovens are becoming more commonplace in kitchen designs that have the space allowance for them. 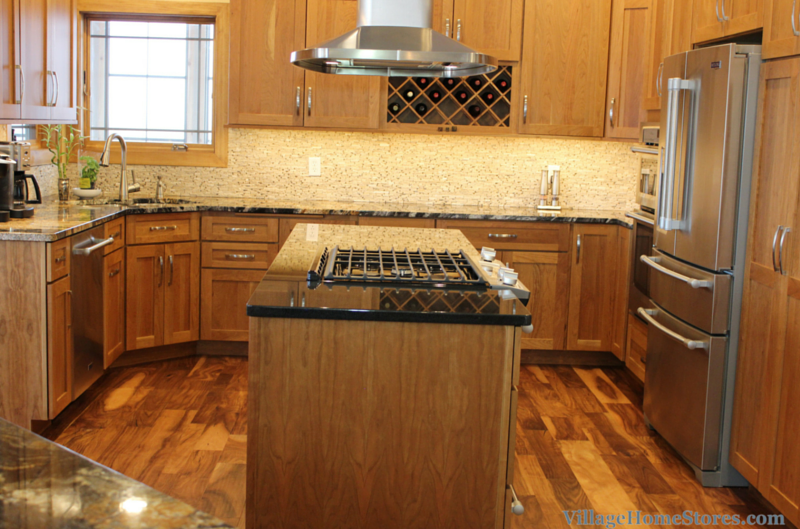 This kitchen is in a new construction project, so space was available for whatever layout options the new homeowners were wanting. 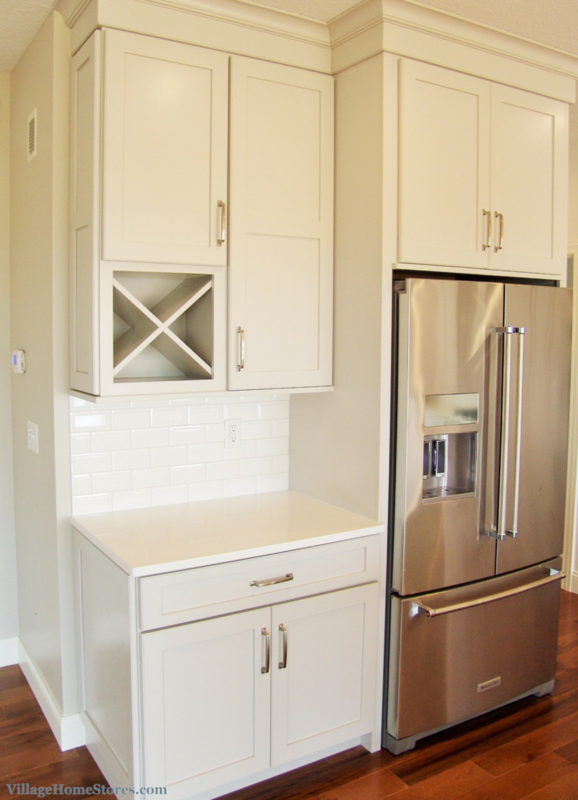 The layout of the two tall units on the hood wall was arranged by “stacking” varied styles and sizes of wall cabinets in place. 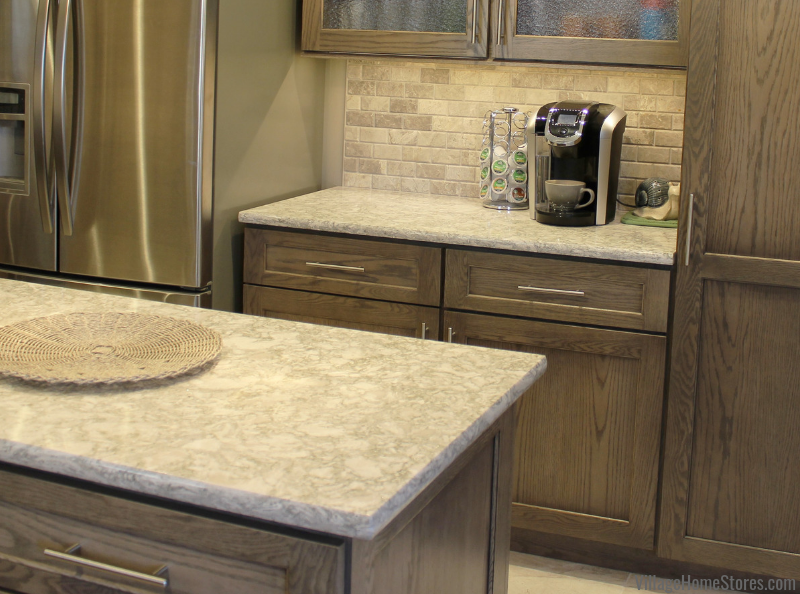 Within the Koch Classic line, our kitchen designers are able to work with the factory to then build these units as a single item in place of shipping them all individually. 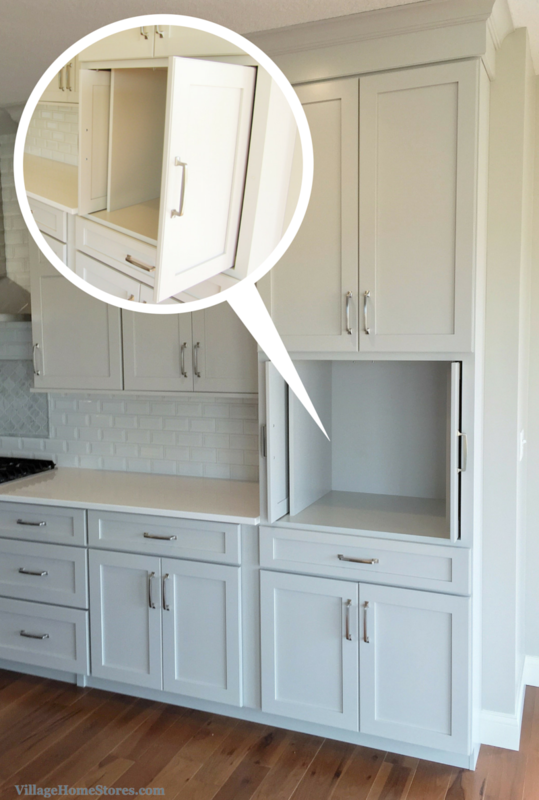 Installers certainly would prefer to work with a single cabinet in place of four, but we admit this cabinet was built with the finished look in mind. 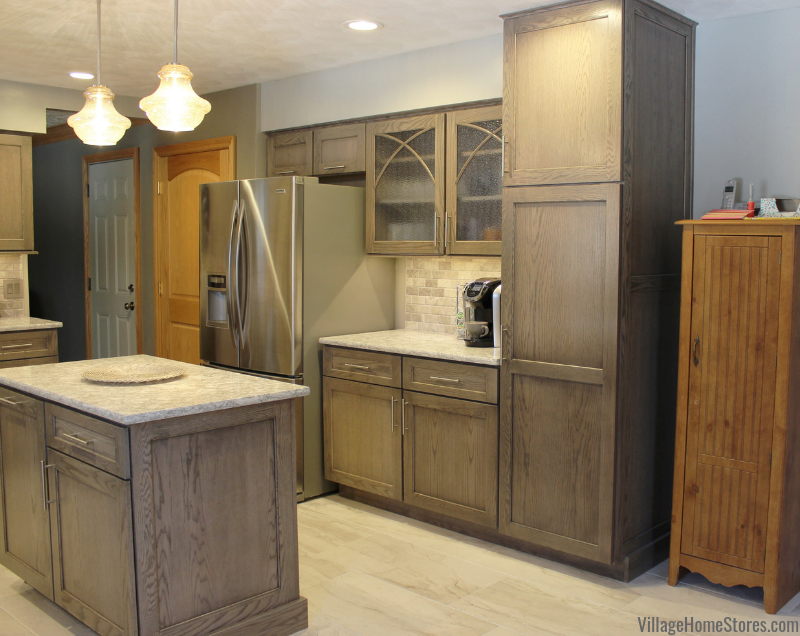 The true motivation for having these tall cabinets built as a single unit instead of individual items is to achieve a seamless and customized look. 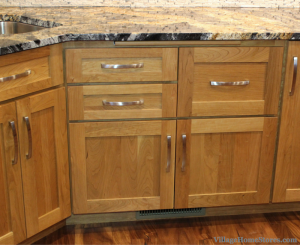 Speaking of custom look, these cabinets are not something you can just walk into a “Big Box” store and purchase. 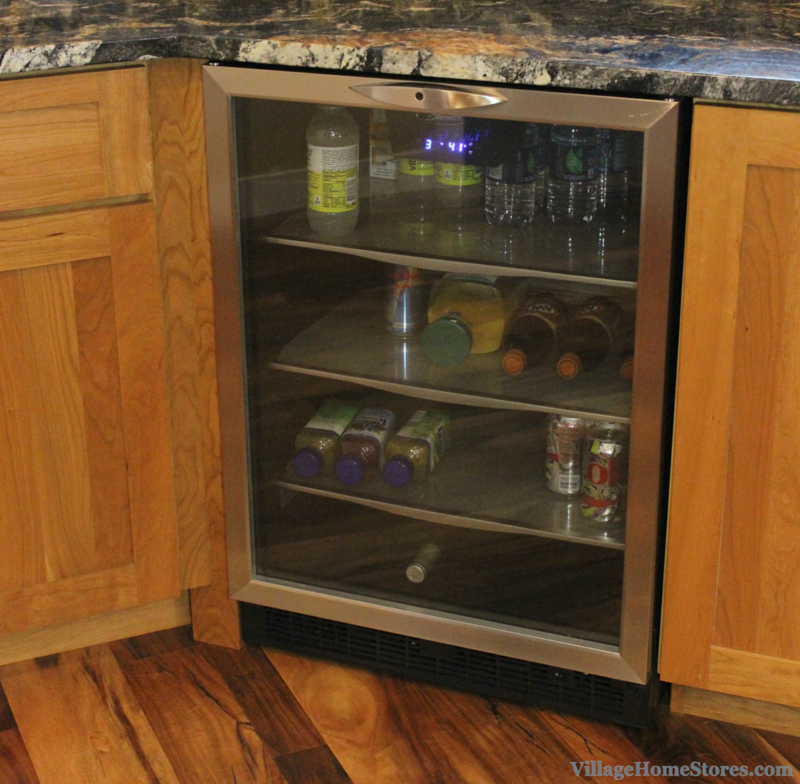 Unique to this kitchen, a combination of doors and drawers surround a double wall oven on one side of the wall, and a full floor-to-ceiling pantry cabinet on the opposite wall. 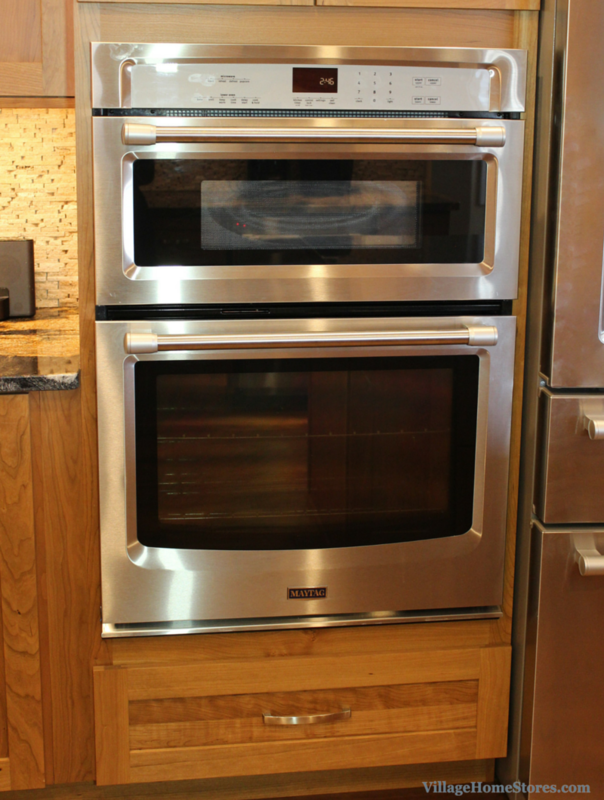 To mirror the visual “weight” of the double oven cabinet to the left, a tall unit was designed with a versatile storage space within. 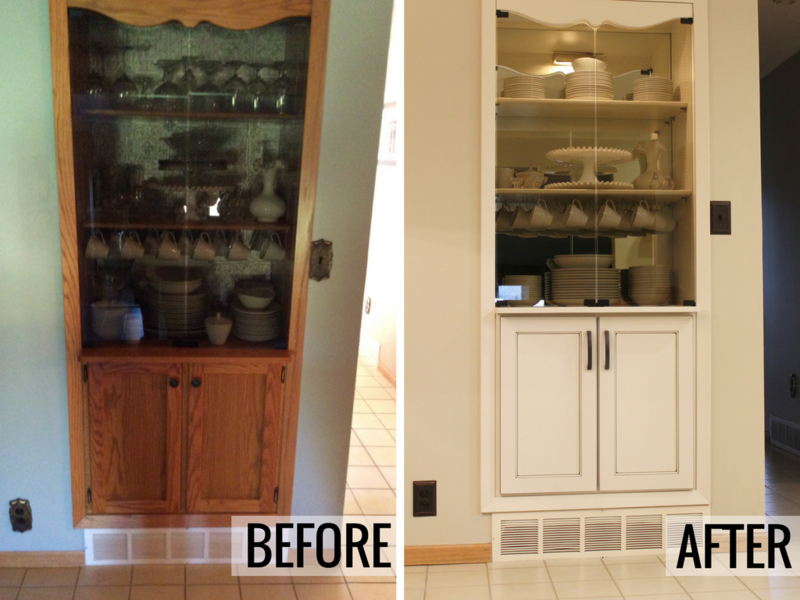 This tall unit on the end also helps visually cap off the “end” to the kitchen perimeter in the Great Room space. 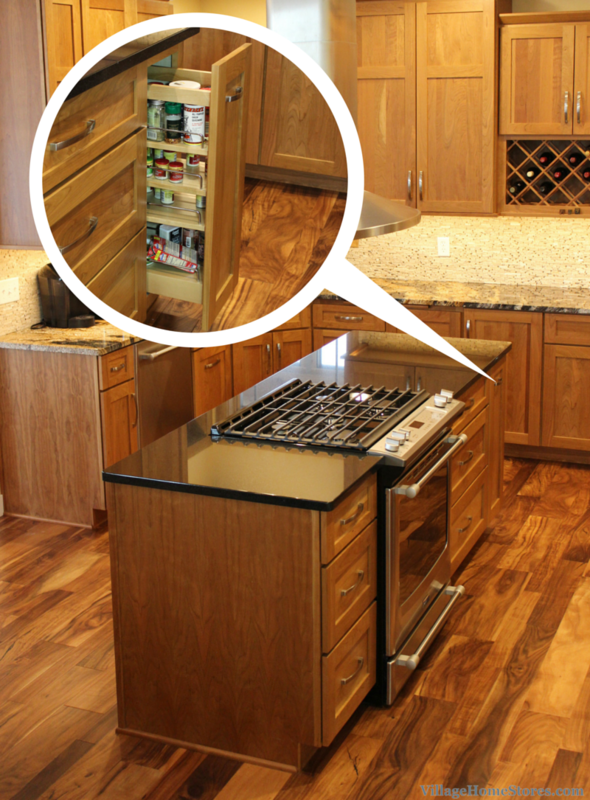 The center of this tall cabinets space has been fit with “pocket” doors that can roll back into the open void. This space was designed for microwave or television area that could be hidden away behind doors when not in use. 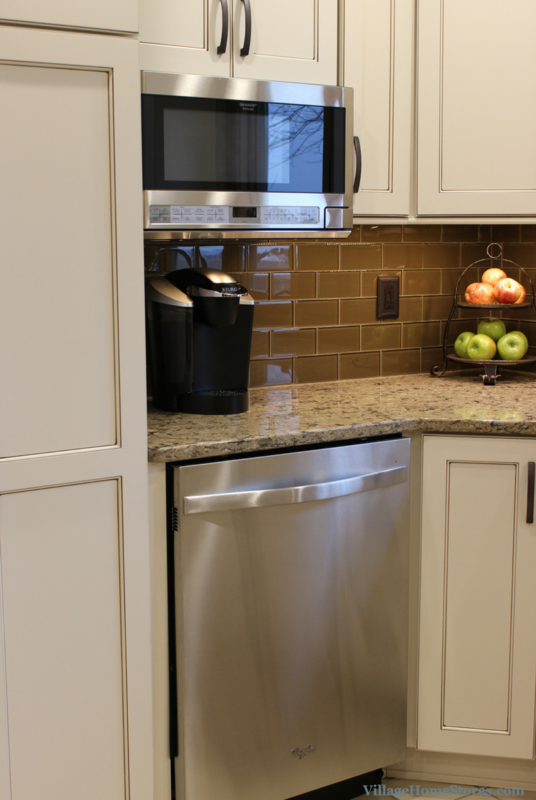 Add a slide-out shelf on the bottom of this space and you could even house a roll-out coffee station like this example in Bettendorf, IA. 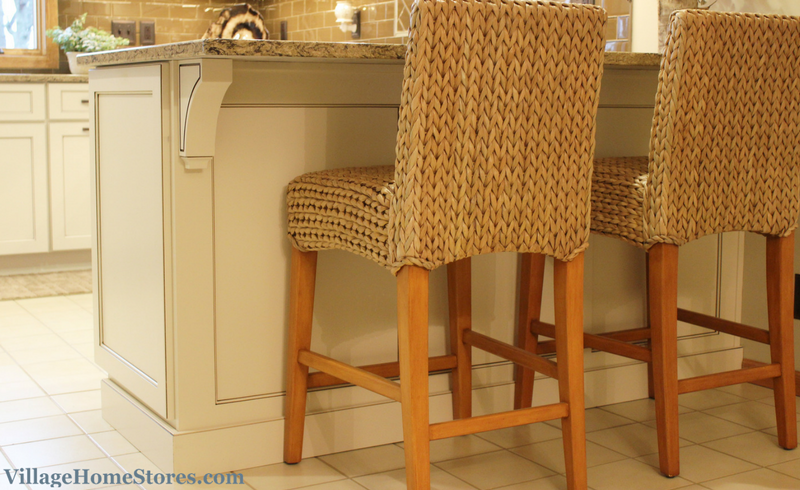 Another way to give your kitchen or bar area a custom tailor-made look is to have a wainscot panel made to the finished dimensions of your island. 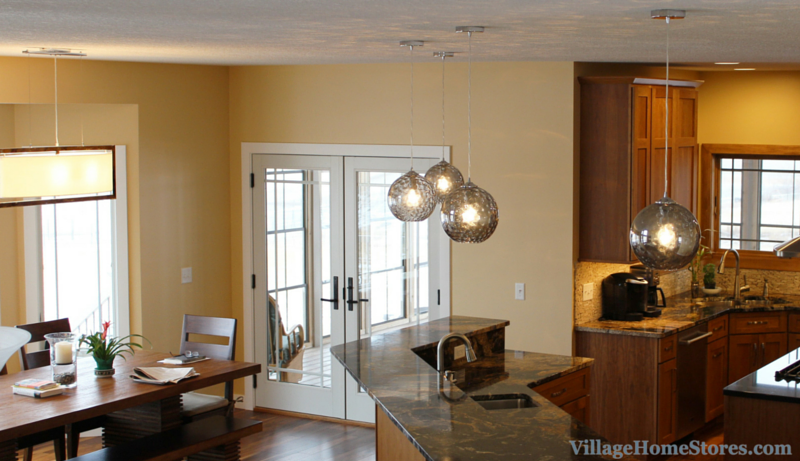 A similar look can be achieved with a smooth panel and trim. 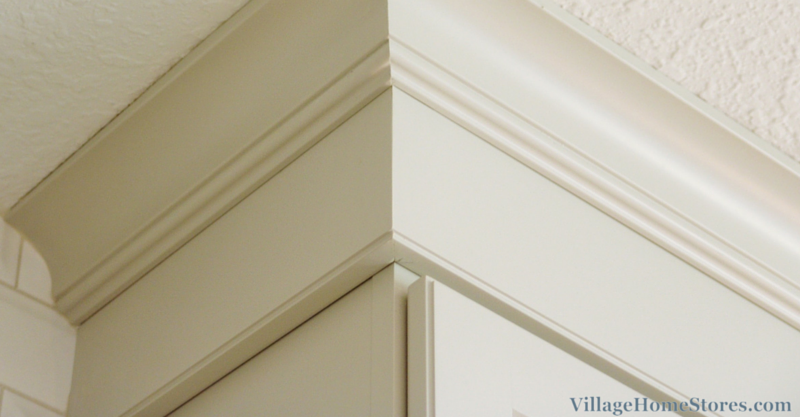 A true custom wainscot look looks as seamless as possible and the best way to get that look is to have a panel made to fit. 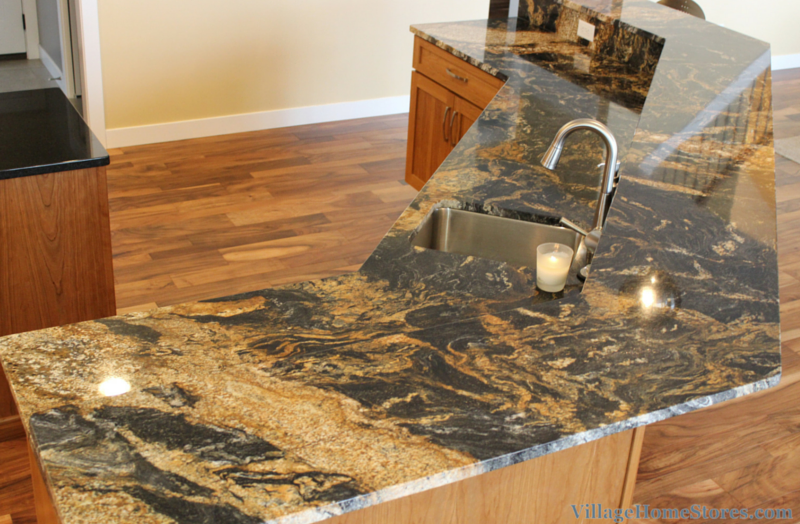 Another custom detail can be found where the flooring meets the island. 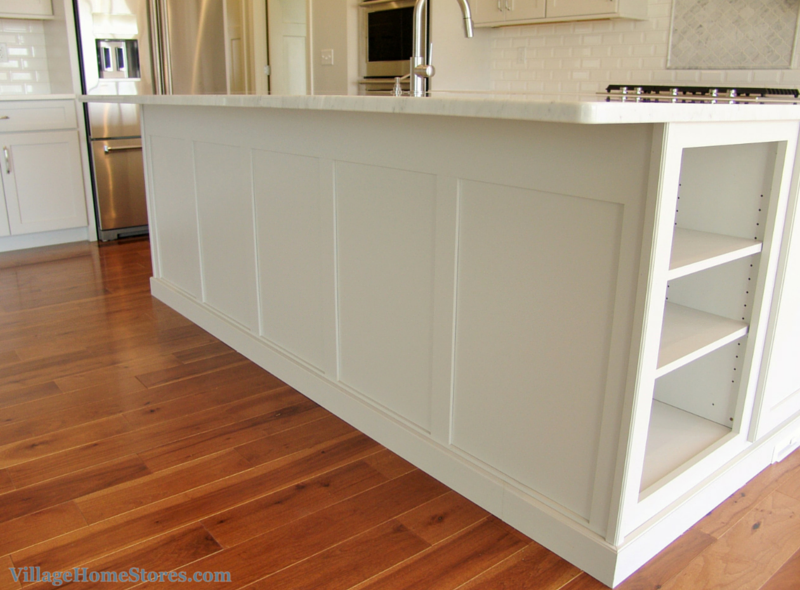 The baseboard molding used to surround this island was not baseboard molding at all. 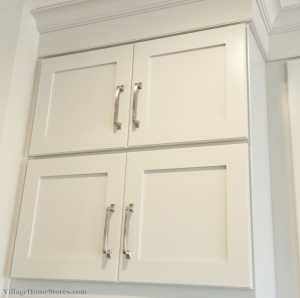 The same “Crown Riser” trim used to achieve the stacked molding look on the wall cabinets was used as a basebord. 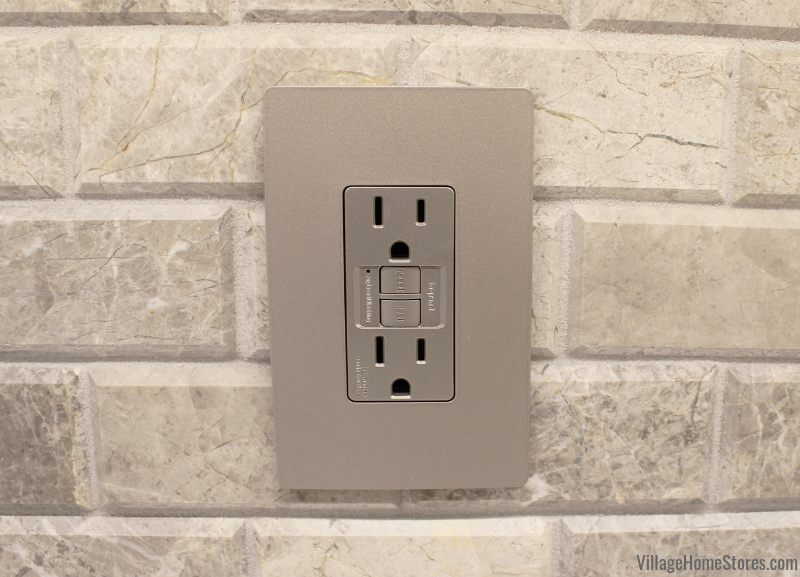 Great design is always found in the details. 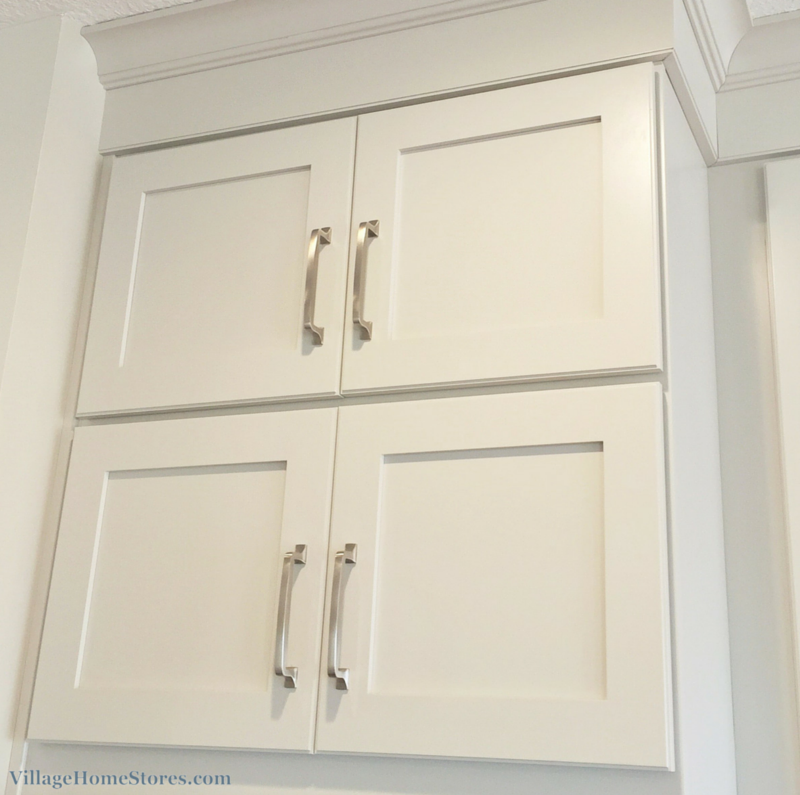 Details like an edge profile that matches exactly on the crown molding, door and drawer edges, and even the baseboards. That is a design detail perfectly planned out. Speaking of details all working together, take a look at this magazine-ready hood area. 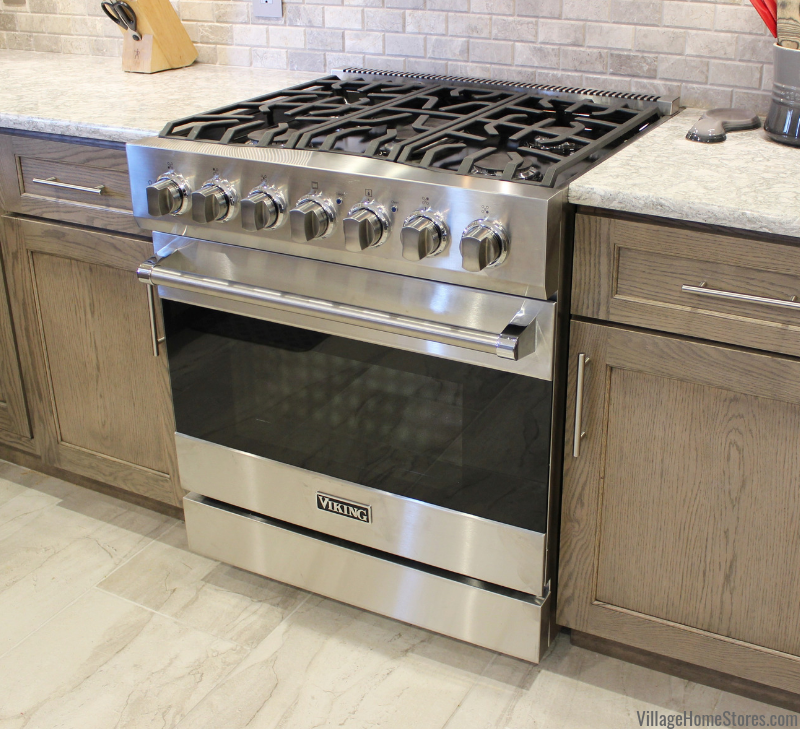 Located right at the center of all activity is a 36″ wide 5-burner gas cooktop with a 36″ wide chimney-style hood above. 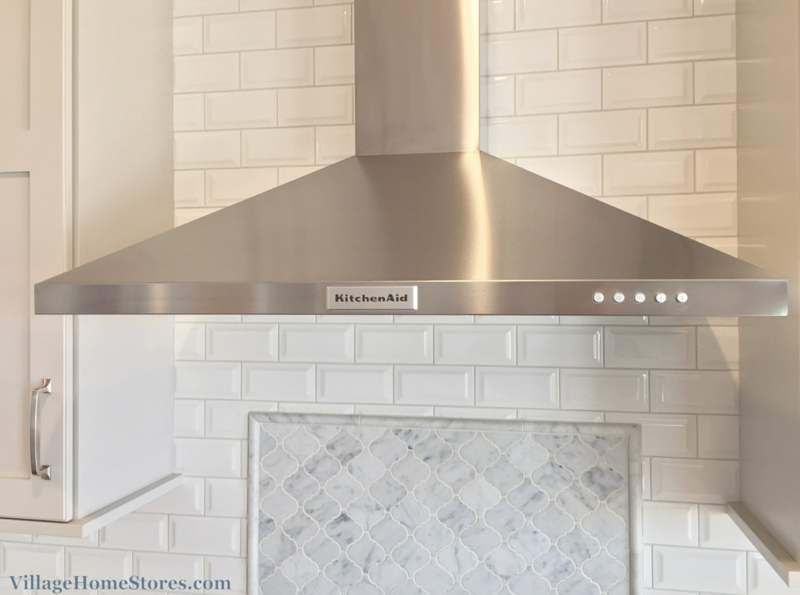 This 3-speed canopy hood by KitchenAid is nothing out of the ordinary but when placed in this setting, it steals your attention right away. 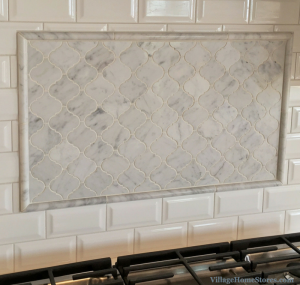 What is helping grab your attention to look at the hood wall is the backsplash tile found there. 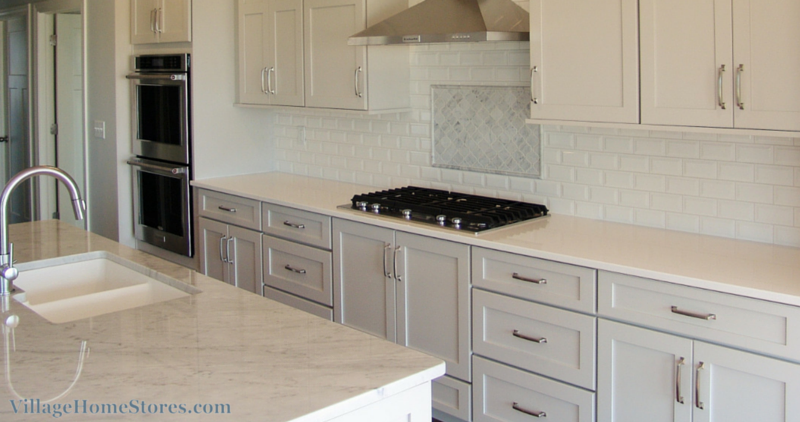 White subway tile continues to be as popular as white painted kitchens. But we mentioned before to pay attention to the details on this project. 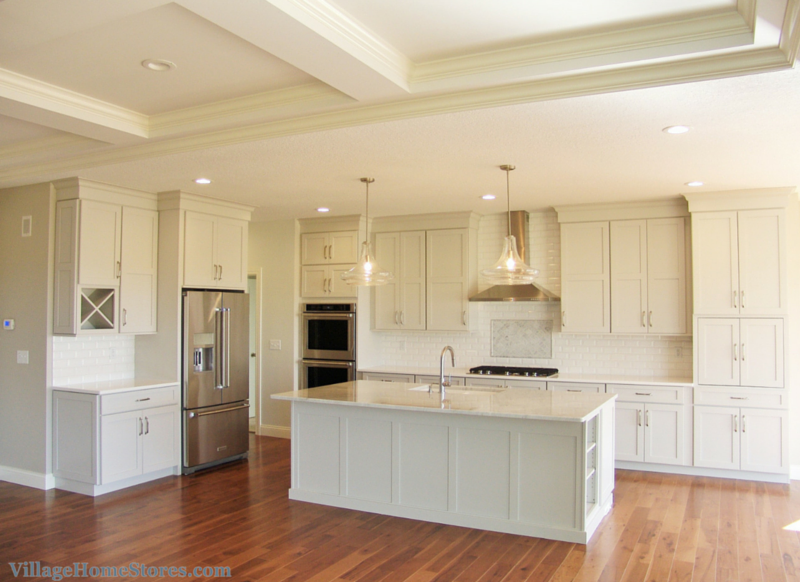 Any of the “dream kitchens” you might have saved to Pinterest or Houzz include white subway tile? 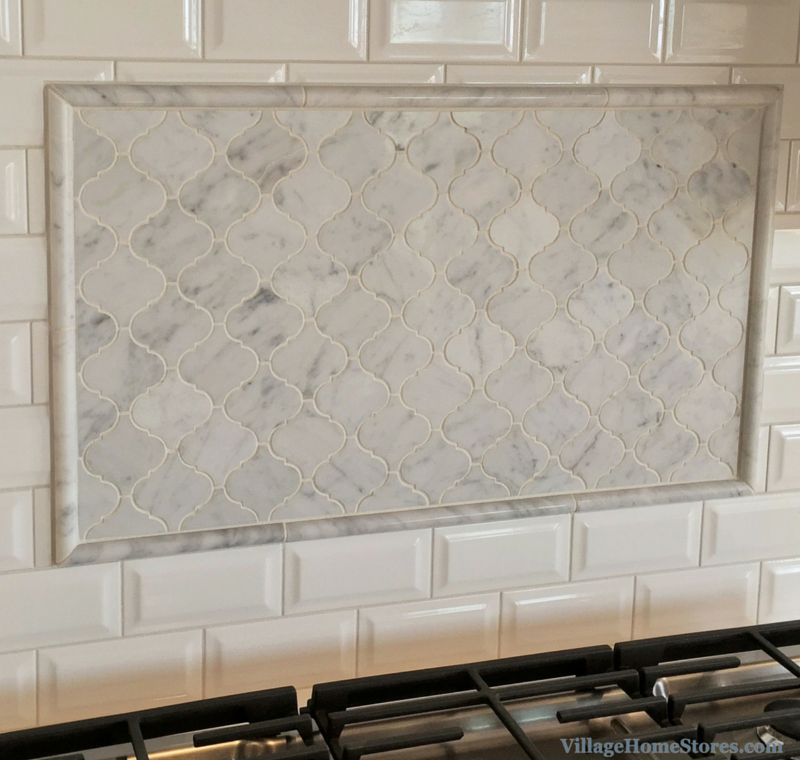 Revisit some of your favorites to see if that tile is a “beveled” subway tile. 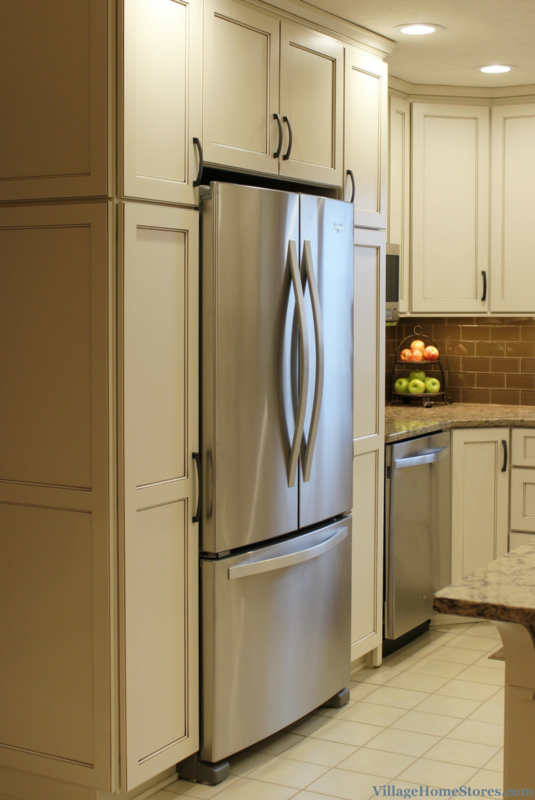 How can a long wall of white cabinetry with white tile still seem to have a lot of depth and style? 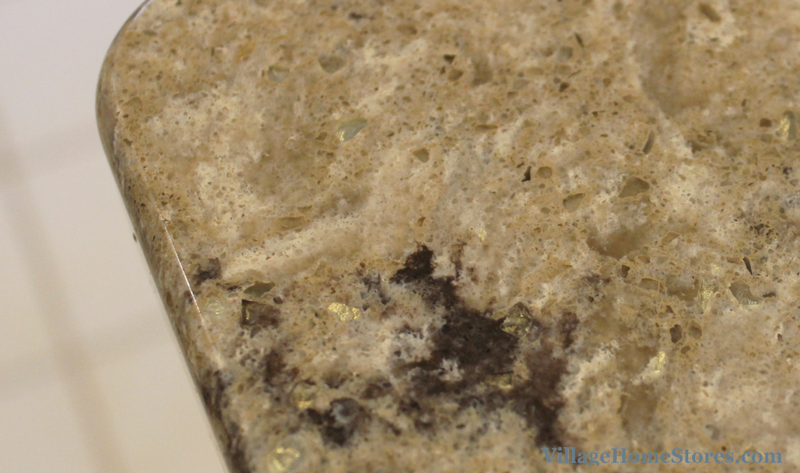 The answer is texture. 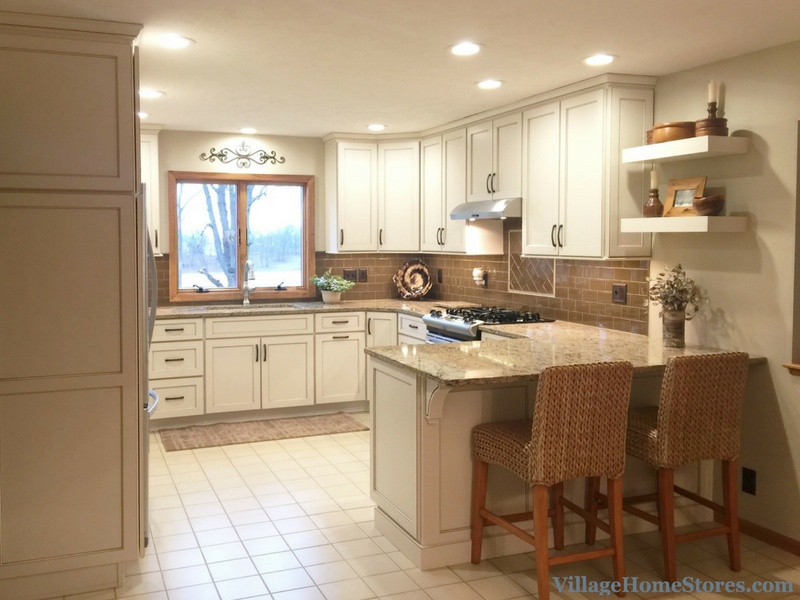 By using a beveled subway tile in place of a standard 3 x 6 smooth look, shadows are formed on the surface. 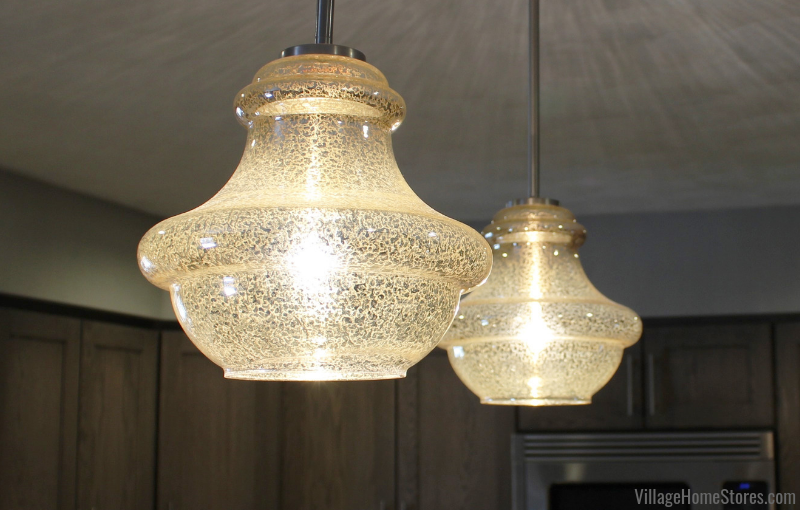 This adds a tone-on-tone dimensional look to the wall. 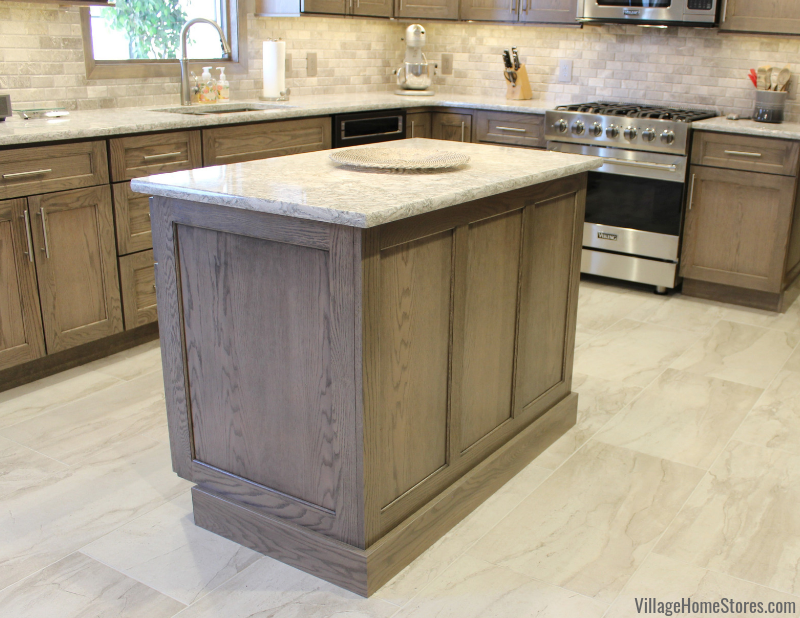 A range accent section of tile has been added and the same Carrara Marble material used as the island countertop is repeated here. 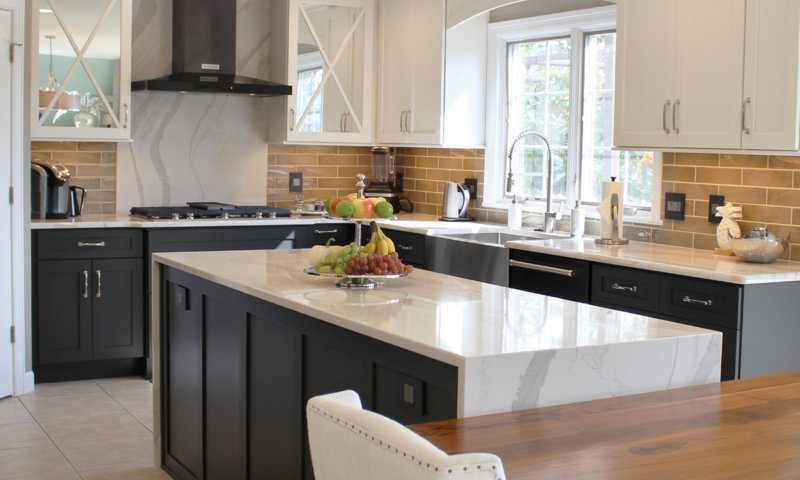 Cararra Marble was installed as the island countertop in an “Eased” edge profile. 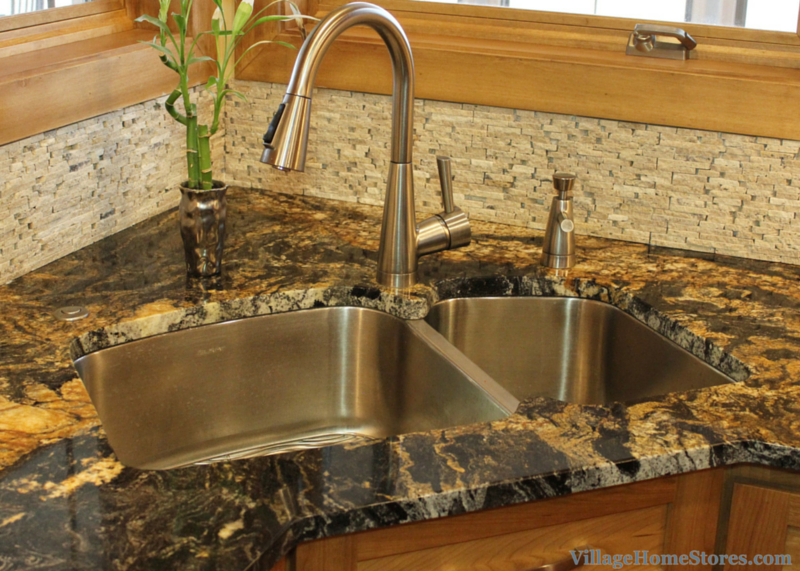 Cambria Quartz counters surround the perimeter of the kitchen in the “Dunmore” design. 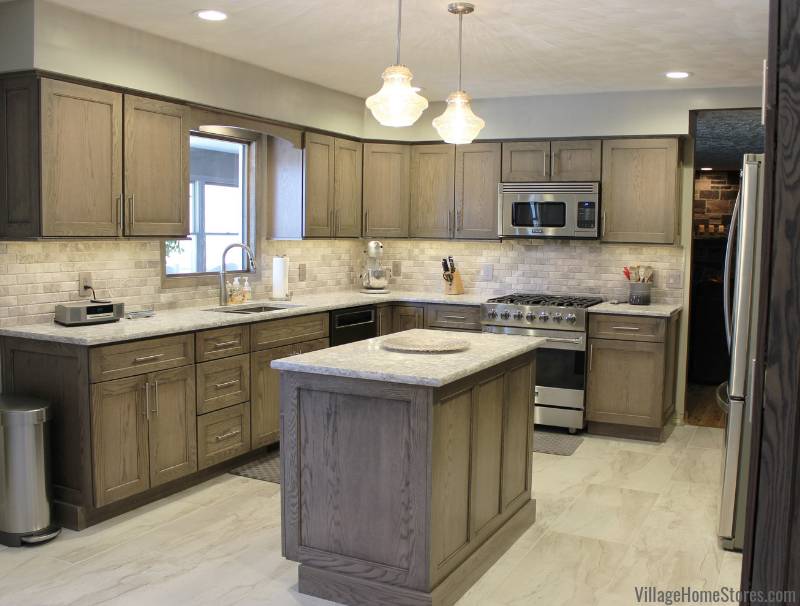 This Hazelwood Homes Inc. kitchen has all of the details to make it a great finished look. 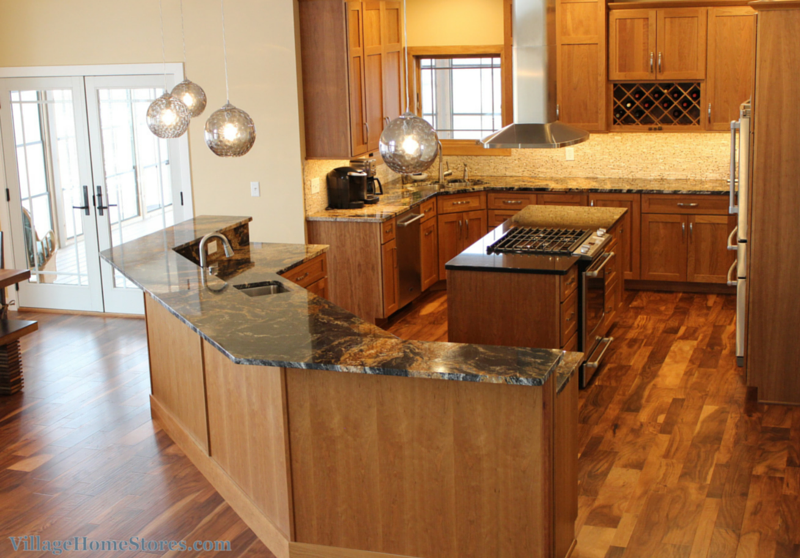 See the full album of nearly 30 photos from this kitchen here over on our Houzz page. 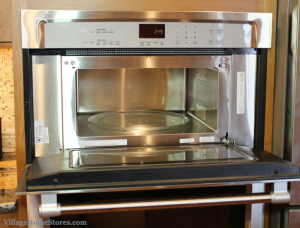 Are you ready to start working on your own dream kitchen? 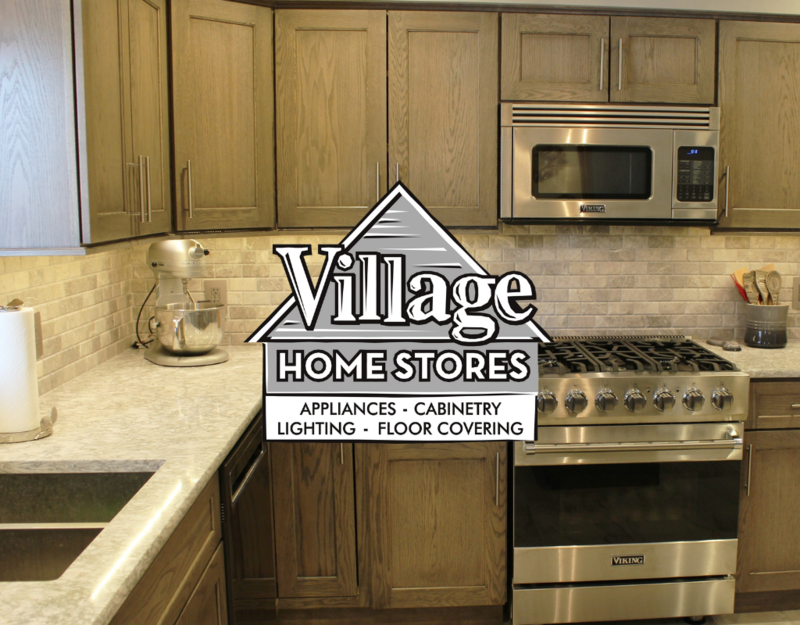 If you are planning on building a home and want to work with the expert design team at Village Home Stores call today for an appointment! 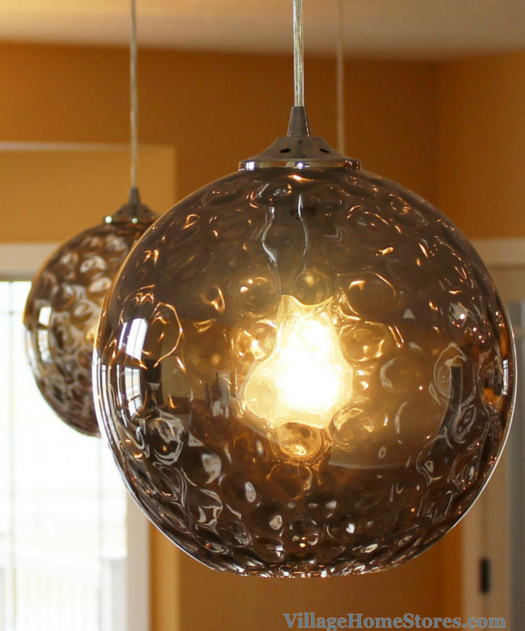 Don’t forget that New Construction customers receive discounted pricing as well as the opportunity to bundle your purchases together store wide for credit towards your lighting package. 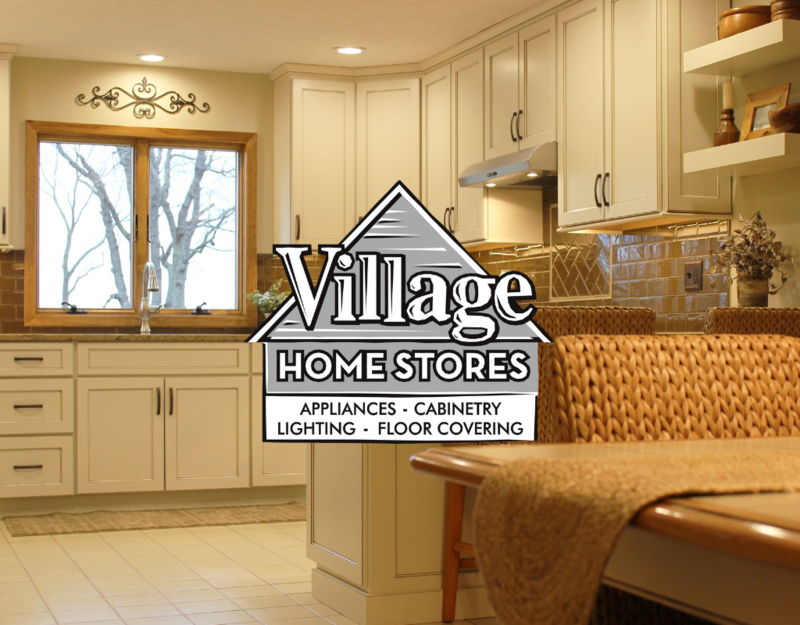 Let us help you design and select product for your dream home. 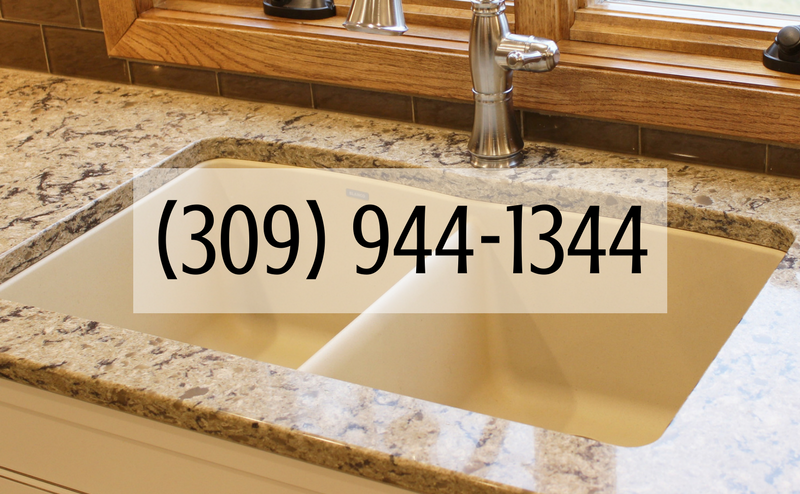 With our very first snowstorm of 2015 on the way to the area, we thought what better project feature to “snow” you in with than this Rock Island, IL bathroom remodel. 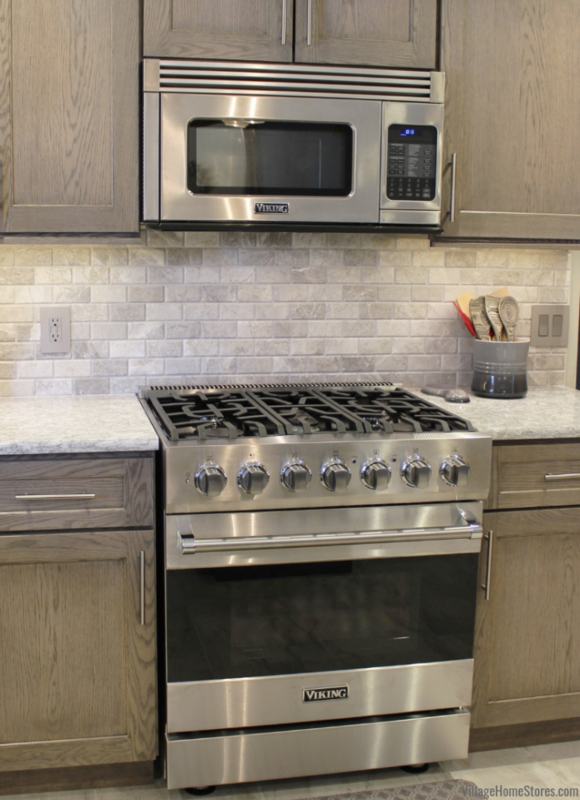 We absolutely love the finishes this customer selected from our store to create an upscale look with touches of texture and sparkle we can’t wait for you to see. 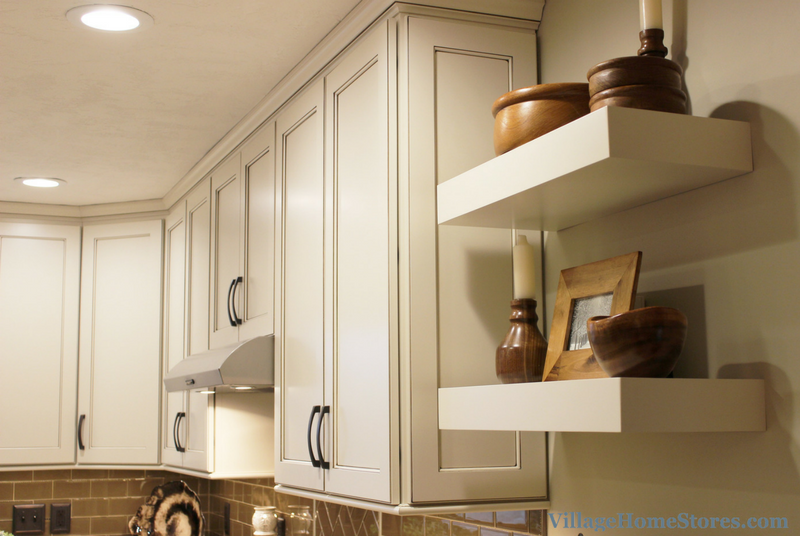 Painted white cabinetry from our Koch line is accented with a grey “Smoke” glaze on all of the vanity edges. 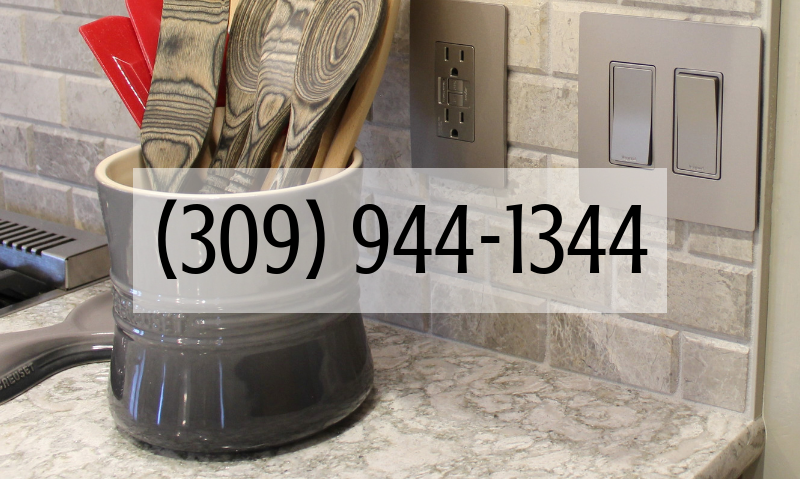 Large gray 12″ x 24″ floor tiles create the perfect base for the new bathroom. 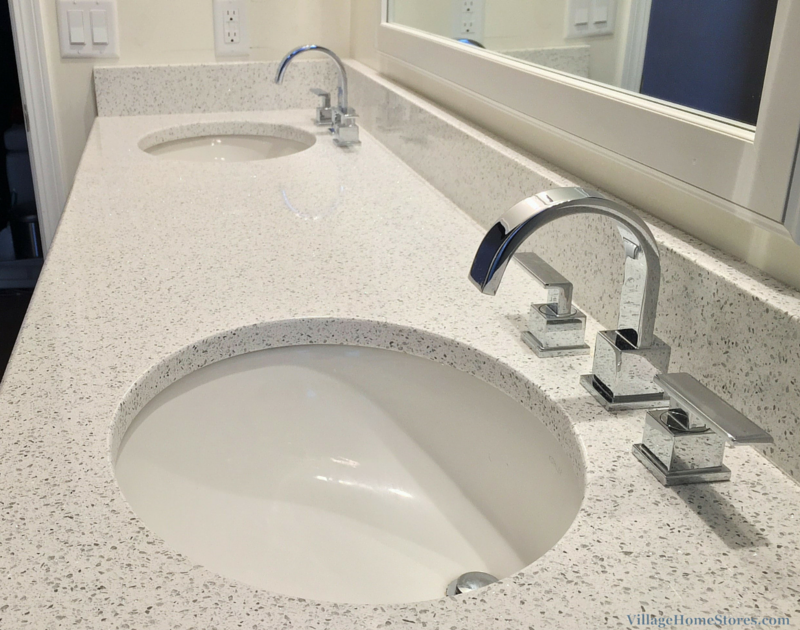 Polished chrome fixtures like the Delta “Vera” series faucets and shower fixtures are very sleek. 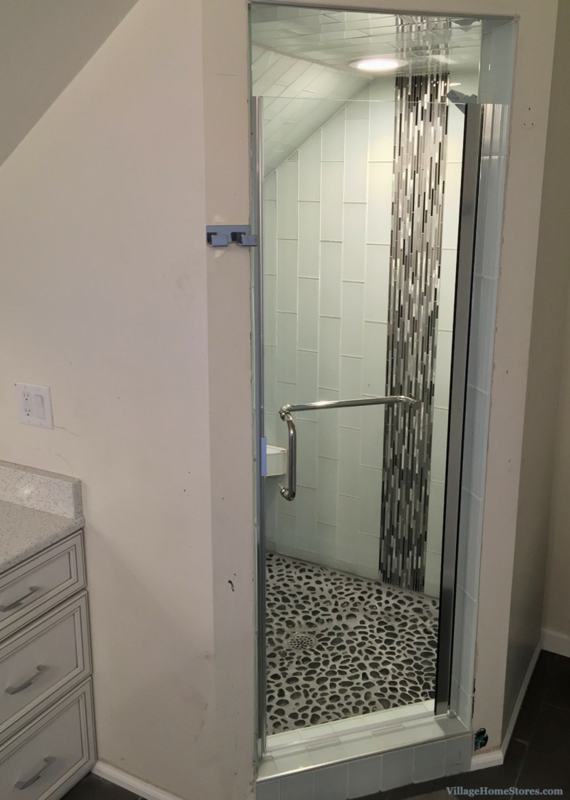 The tile in the walk-in shower is what truly steals the show! 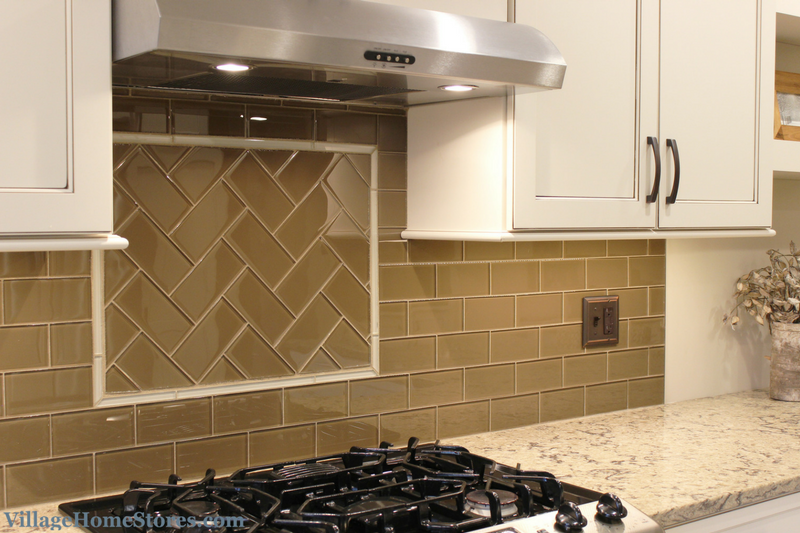 Elongated glass subway tiles 4″ x 12″ in size are accented with waterfalling mosaics from Glazzio. 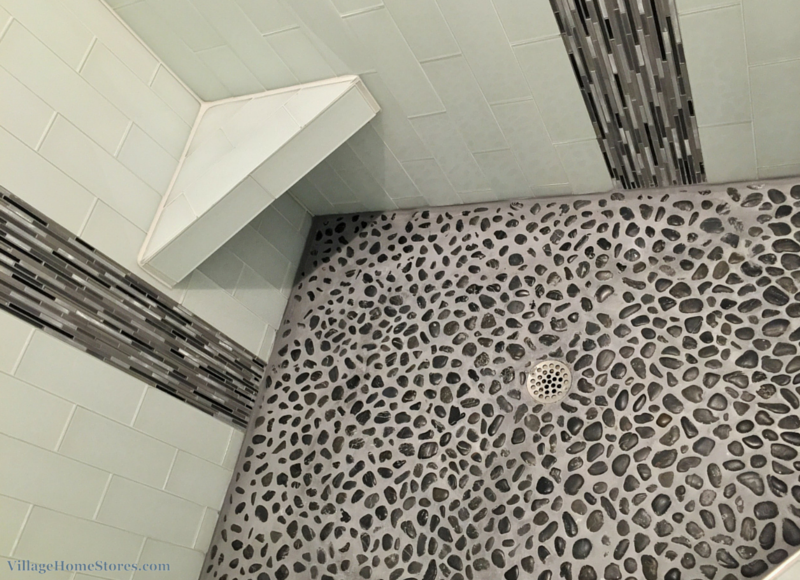 While the wall tiles look smooth and sleek, the floor of this custom shower has an added texture that does bring the outdoors in. Black “pebble” tiles from our Florida Tile line are grouted in place and give a foot massage to bare feet every time you use the shower. You know that perfect sparkle of fresh snow? 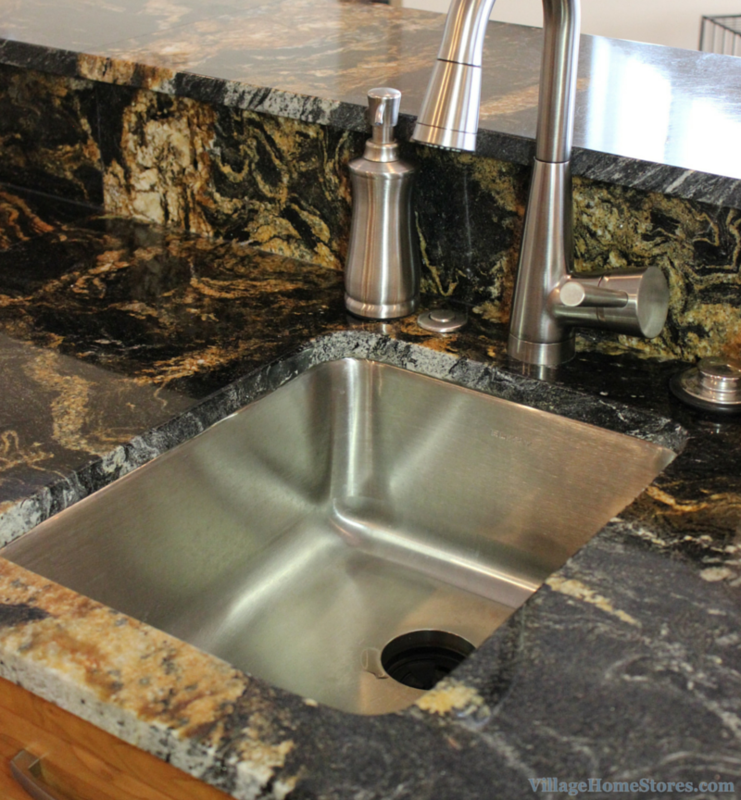 These Cambria Quartz “Whitney” counters have that same glimmer when the light hits them. 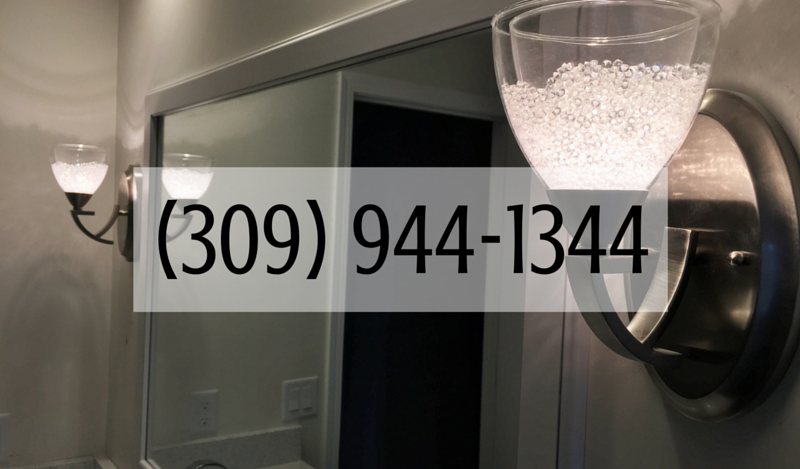 That same glimmer can be found in the crystal-filled wall sconces from Golden Lighting. 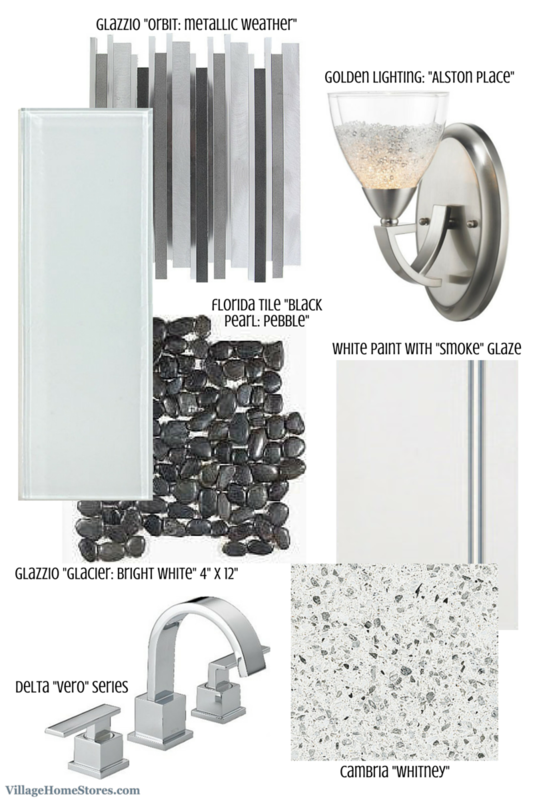 The “Alston Place” series is available in many different fixture configurations from this single sconce to large chandeliers. 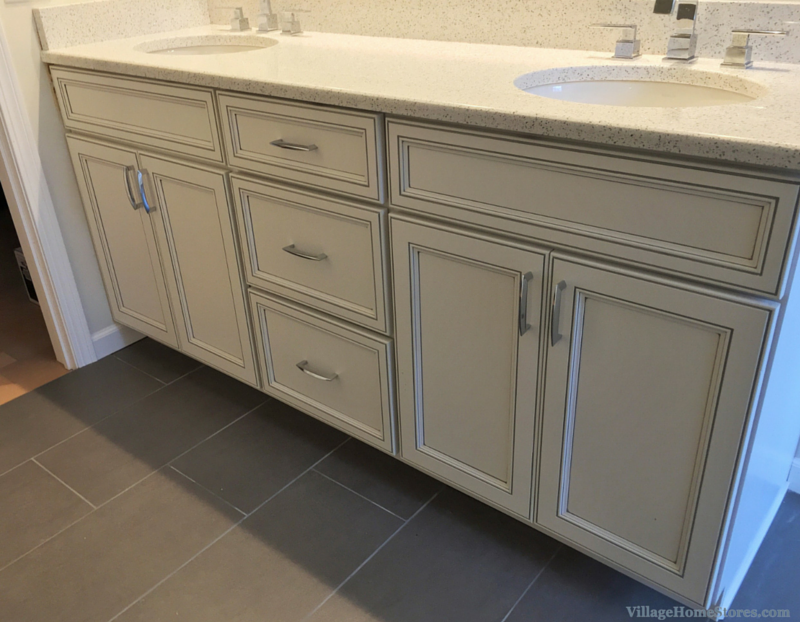 The double-bowl vanity is full of storage and that “Smoke” glaze really does highlight the details and compliment the other finishes in the bathroom. The shower itself was a unique space. 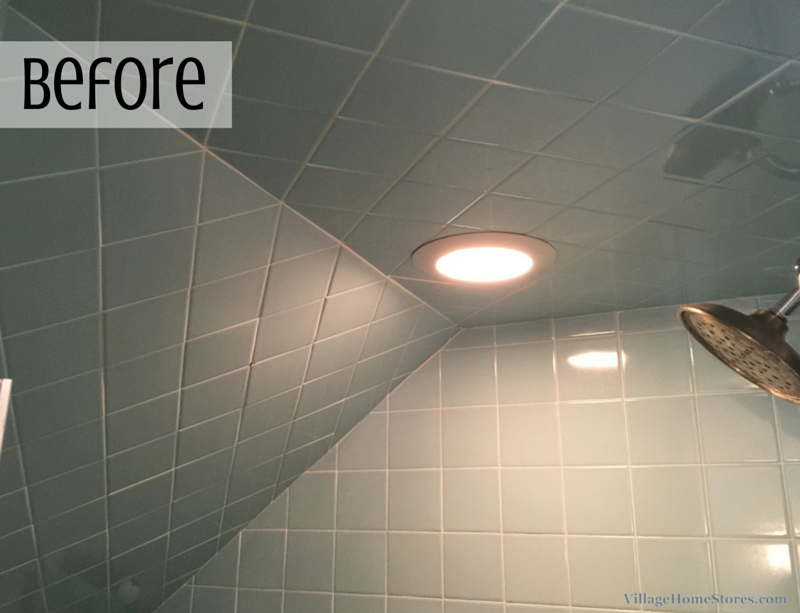 originally tiled with a single size of powder blue ceramic, the new design is a stylish upgrade. 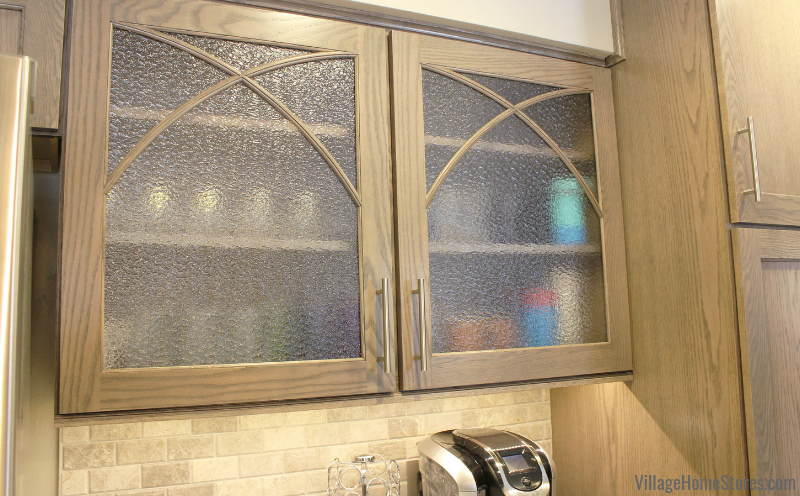 When installing a custom-tiled shower, we are able to add storage niches and shelves and benches like the one shown here below. 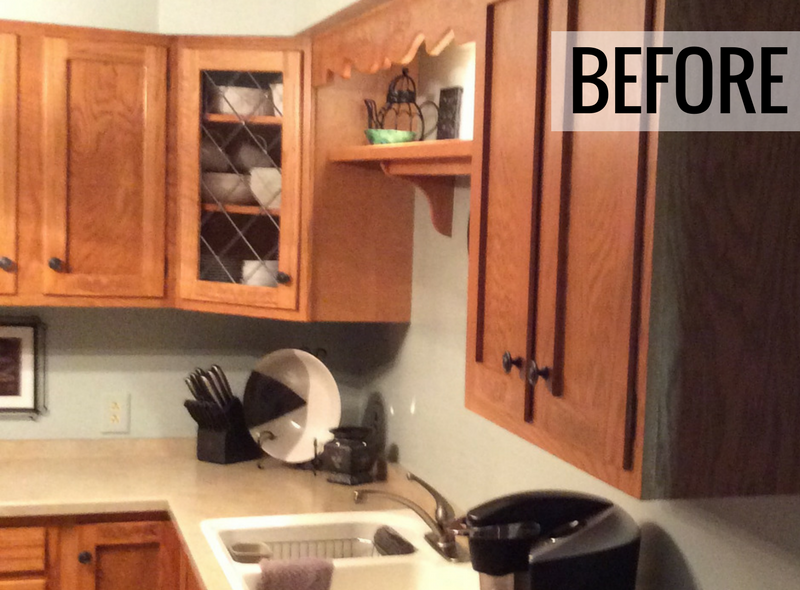 This new shower area was waterproofed and a custom wall niche and corner bench was installed. 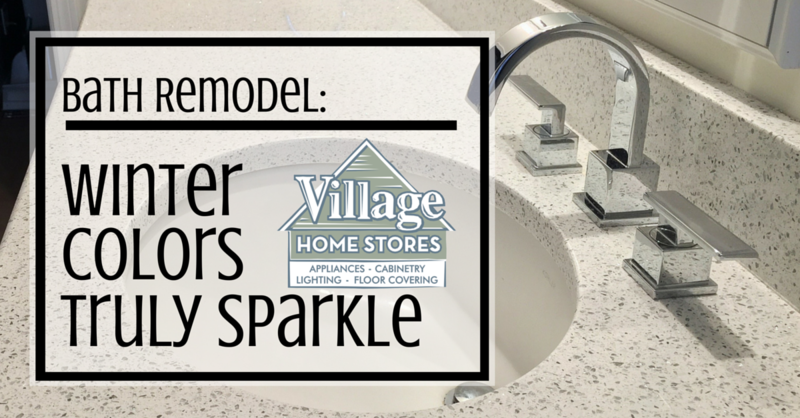 Is your bathroom ready for a while new look? 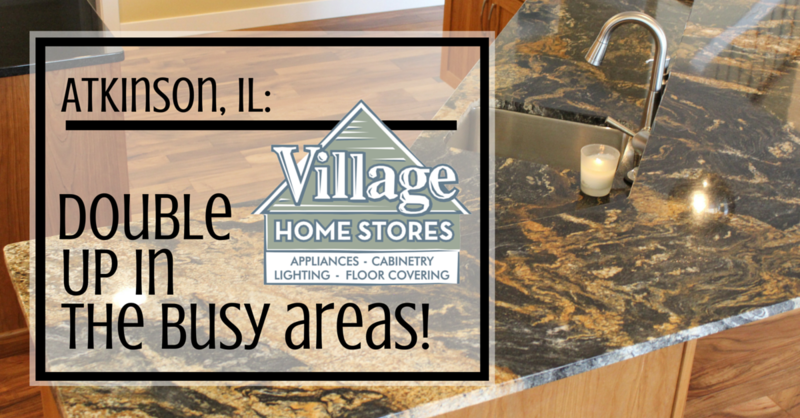 Village Home Stores can help you with that! Just a vanity top, or and entire remodel, we are here for you. 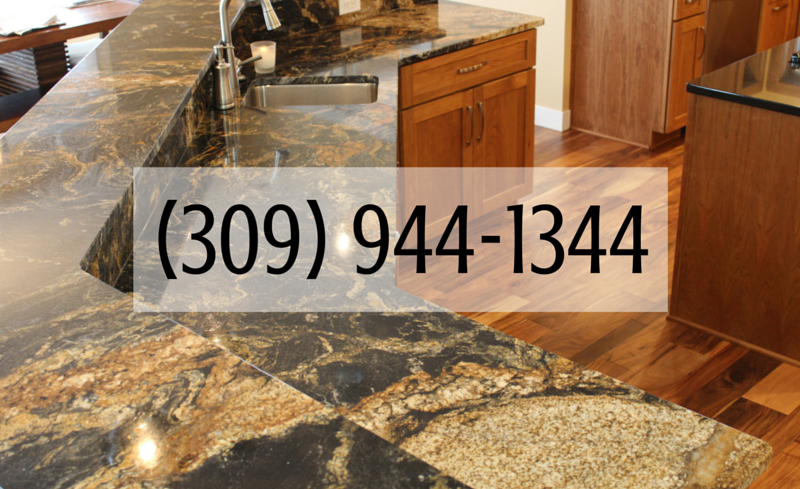 Call us at (309) 944-1344 or click here to schedule an appointment.